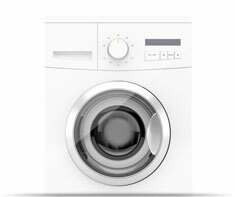 All Clothes Dryers use electricity to rotate the drum that the clothes ride in, and for operating the controls that allow you to set cycle times, the amount of drying to be done, etc. If your Clothes Dryer has natural gas or propane piping connected to it, then it is a 'gas' Clothes Dryer. A gas Clothes Dryer burns natural gas or propane in a heating element, which produces the heat that dries the clothes as they are tumbling in the rotating drum. An 'electric' Clothes Dryer is a model that uses electricity as the source of heat for drying the clothes as they are tumbling in the rotating drum. If your Clothes Dryer does NOT have natural gas or propane piping connected to it, then you should put checkmark for 'Clothes Dryer (electric)' as one of your home features in your Home Wizard app. All Clothes Dryers will have vent piping to the outside of your house, where hot air and lint from the drying process will leave the unit. Some models of Clothes Dryers are stand-alone units, and some models are integrated with a Washing Machine. If your model has a Washing Machine unit with it, then you should put checkmarks for BOTH Clothes Dryer (gas) and Washing Machine as your home features in your Home Wizard app. The heating element and tumbling action of a clothes dryer creates lint, which can build-up around your dryer and cause problems. Shown in the 'Routine Care' section are the recommended routine maintenance tasks for your clothes dryer (gas). The 'Q & A' section shows answers to common questions. And the 'Articles' section provides helpful articles about your clothes dryer (gas).